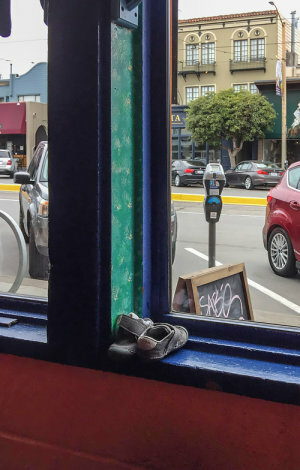 We sat down to lunch at El Toreador the other day and were immediately distracted from the menu by a pair of tiny shoes perched on the window sill. 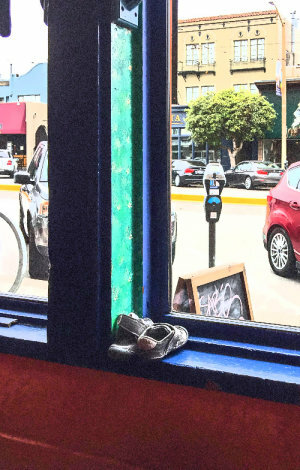 Shoes on the Sill. An iPhone capture recomposed with perspective control. The only camera we had with us was our iPhone 6 Plus with its wide angle lens. That wide angle perspective, we knew, would minimize the importance of those shoes, which were the very thing that attracted us to the shot. We hoped we'd be able to crop the image to emphasize the shoes. And we hoped we'd have enough image quality left so you didn't have to be told what you were looking at. And we just might have. Barely. But as Cinderella might have confirmed, the shoe doesn't fit everybody. And these shoes were a bit tiny for the image quality feet we had. One of the lessons art history can teach you is that detail itself can be variable. You can't help but admire the miniaturists who painted with single-hair brushes. But the Dutch masters simulated lace with bigger brushes and the Impressionists dabbed color to blunt to create detail. Both without penalty. So if you find yourself with an image you love but without the resolution you need, it might pay to emulate them. We like to think of this as playing with granularity. Granularity suggests you might not really need a lot of detail to create a picture that conveys what moved you to capture it. Instead, granularity provides some level of abstraction that nevertheless expresses the idea. With this image, we tried a few simple granular approaches. We used Photoshop's art filters for Film Grain, Paint Daubs and Poster Edges. 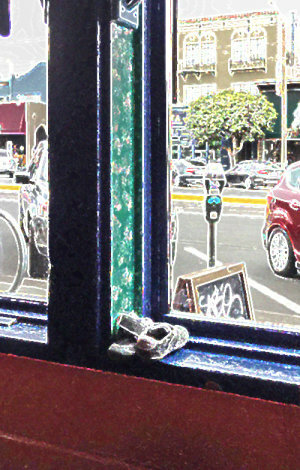 Film Grain nicely conveyed the image of a pair of small shoes on the sill while Paint Daubs just barely makes the cut (although it's easier to read full size). Poster Edges did a very good job of drawing the scene. We also used a Guided Edit in Photoshop Elements to make a Watercolor rendering with paper texture. The rollover shows the three artistic renderings of the straight shot at the top of the story. We did use perspective control to straighten the original image before working on the rendering. OK, we could have used a little more detail. But you get the idea.